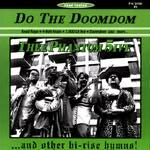 Thee Phantom 5ive have been putting out seven inch material for a while. From the start, they exhibited a flair and energy. In the beginning, they were quite garagie, but I think this long overdue first CD demonstrates that they are the most improved band of the year. The album is very listenable, quite fun, and shows solid musicianship and writing. The cover material is for the most part either unusual, or arranged so you don't care that it's been done before. The album is mixed by Eddie Angel (Los Straitjackets), with Danny Amis (Los Straitjackets) on bass on track 6. There is a 17th track, which is untitled. It sports some radio revival samples and a thick sludgy beat and, well, it's just a radio evangelist bashing oddity. Interesting for one listen, but I'll take Wilderness Road's "The Gospel" any day. It is quite a long trip. Pure surf, fast and playful. It's riff based, but the riff is very fun, and very friendly. The double picking is speedy and fiery. I really like the rhythm guitar on this track. Solid riff and perfectly countered to the lead. Way fun, and infectious. It ends with a skid and a crash, and a no-start engine crank. This is a mighty fun arrangement of a traditional rag, played like tomorrow is the last one and there's too much fun left to have. Rompin' good fun. Wade Storie wrote this, and played guitar as well. It's something like the Planet Rockers in approach, but more reverby. A fuzzy cover of the Ventures' tune. The clean second guitar under the fuzz is the savior of this track. It's suave in spots, and garagie in others. This is a smooth jazzy and vibratoed interpretation of Django Reinhardt's "Nuages." It is VERY nice, and a remarkable shift in style from the rest here. The great second damped guitar adds a surf air for excellent listening. Henry Mancini's only surf intended tune, with Danny Amis (Los Straitjackets) on bass. A nice arrangement, somewhat different than others, but still reverent to the Astronauts' who originated the surf interpretation on their "Surfin' With The Astronauts" album. This is more cool, and the reverb is swell. This is a Wade Storie tune. This is nice, well arranged, and sports splendid double picked guitar. This track really impresses you with the polish these folks have achieved over the last few years. This is a strange track, brooding but not mean, morose but somehow optimistic. The percussion at the end is really nice, making you angry at the fade out. Another sharp turn off of the turnpike with a suave surf treatment of Ike Turner's excellent tune. This makes you wanna smoke one of those stinky Cuban cigars... well maybe not, you don't know where it's been. This is quite fun and infectious. Banjo master Earl Scruggs penned this. Thee Phantom 5ive almost do it justice. This is a chord dependent number, with a solid rhythm and a subtle melody. I'd have liked to hear the lead more, but it works ok. The melody is solid and the playing is excellent. This tune was originally a Japanese release from the Ventures. Thee Phantom 5ive give it a more surf feel, but the mix is a bit shallow, sapping some of the energy out of it. Excellent playing and arranging. Many modern surf bands do this number, from the Surf Raiders to the Mermen. The Creations did it originally. This is among the stronger covers, tight and very energetic. It swims with reverb and whammy. Ultra suave, super reverbed, and directed at the "we'll be right back" place at the end of the first set. Rhythmic and fun, with very fine surf tones. Like something Spike Jones would do if he were in a surf band. This conjures images of clowns running around with big shoes and bopping each other with bats. Total dyslexic fun.